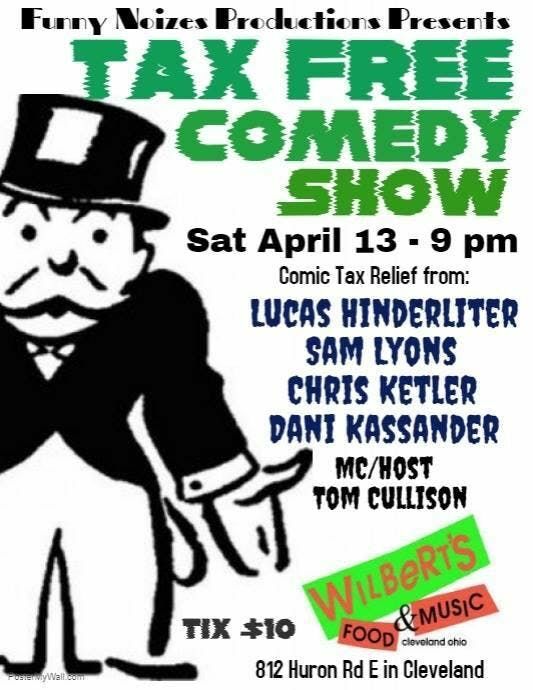 Back by popular demand, Funny Noizes Productions is please to announce TAX FREE COMEDY SHOW STARING LUCAS HINDERLITER on Saturday April 13, 2019 at Wilbert's Food & Music in Cleveland, Ohio. 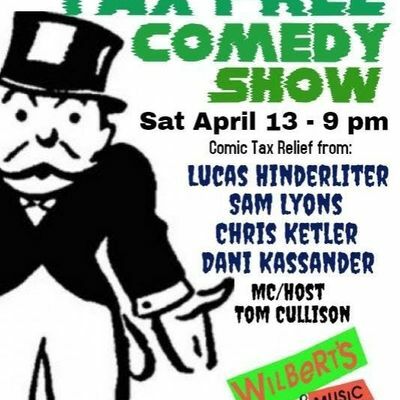 Headlining tonight's show is Lucas Hinderliter, hailing from Illinois, Lucas has featured and headlined throughout the country. Credited with his prolific joke writing skills, He's distilled what he's seen and learned through his life into a dark, smart and quirky comedic vision that finds the universal humor in everyday angst. Lucas is leaving audience weary from laughter all over the country. Lucas is known to quickly wins over crowds with his quick wit, likability, and sarcastic observations. His rapid-fire delivery and onstage charisma make him one of the hardest working and most notable acts in the midwest. Featured tonight: Sam Lyons spent his childhood watching Jeopardy! and Judge Judy- and it shows. The son of a blind jazz musician turned black republican, he understands the importance of finding humor in everyday life. Whether it’s reliving his first Brad Paisley concert, lamenting failed relationships and deaths in the family, or testifying to the complexity of growing up “technically black” in the South- every moment has a punchline. In addition to regular appearances on shows in the St. Louis region, Sam also co-produces a monthly showcase “Yours, Mine, and Ours”, has hosted for America’s Got Talent’s Taylor Williamson and YouTube’s JP Sears, and took second place at High Ridge, MO’s 2018 Toasted Coffee House Gilmore Girls Trivia Night. Listen to Impolite Company every Monday on ImpoliteCompany.com for his podcast, “The Lyons Den”. Special guest Dani Kassander has been an EMT, a substitute teacher, security guard, and an animator, but for years had a secret dream of being a comedian. It wasn't until she was pushed into the spotlight by loving partner, Jacob, that she finally had the courage to give it a shot. Hailing from PA (right across the border), Dani has performed at Hambone's All Ladies Nights and Glitterbox Theater, as well as Back Room Misfits and Petrucci Brothers. She has also headlined at the gArt Hause, was featured at Giggles & Grub Club and hosted an evening at Sprint. Dani has also progressed to the Semi-finals in the comedy competition at The Improv, and studied at the Unplanned Comedy Warehouse. We know you're in for a treat as we welcome Dani to an Ohio stage. MAKE YOUR RESERVATION to this show or get tickets to any FNP show through 330/Tix at https://330tix.com/organizations/funny-noizes-productions Tickets are a special value at $10 each.